A few of our handmade engagement and wedding rings; the Persephone engagement ring and Flores engagement ring adorned with diamonds and rubies. The practice of marking a deep and binding promise through the giving of precious jewelry, and particularly engagement rings, is ancient. Historically, more so than today, jewelry and gemstones were understood as not just having symbolic significance but also containing power as talismanic objects. When we look at the history of engagement rings, Egyptians are said to have first started the practice of exchanging an engagement ring. Greeks and Romans also adopted the tradition of offering rings as symbols of a binding promise. In a variety of pre-Christian religions, a simple wreath of interwoven rushes, or a small ring woven from the hair of the betrothed, were used to represent a future commitment. 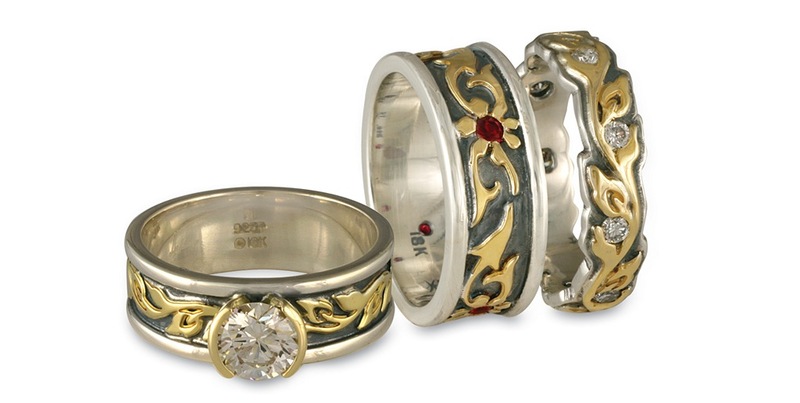 The qualities of the engagement and wedding bands had symbolic significance. Rings were made of every metal from gold to iron, set with no gems at all, or with emeralds, rubies, sapphires, and of course diamonds. The first actually documented record in the history of engagement rings use of a diamond to represent engagement was in 1477, by the Archduke Maximilian of Austria in Vienna. It was presented to Mary of Burgundy. The act had wide influence across social classes, though it wasn’t until the 1800s that diamond adorned engagement rings became widespread in Europe and America. In the latter part of the nineteenth century, more diamond veins were discovered, particularly at the DeBeers farm in South Africa, where boom and bust periods in the diamond trade were common from the 1880s onward. Smaller diamonds became relatively affordable even among the lesser wealthy members of society at the dawn of the twentieth century. The diamond industry grew, and clever marketing such as the "Diamonds are Forever" ad campaign of the DeBeers company made diamonds become more prominent in the fashion of engagement rings. Today, more and more people are concerned about where their ring comes from—similar to the talismanic qualities people felt about their jewelry in the past. Fairtrade Gold engagement rings have become the choice for those who wish to align their values with their purchase.